There’s nothing that can make you question your sanity like the experience of pregnancy hunger. Am I right? Hunger during pregnancy can take on a whole new level of intensity as your body works to tell you what it needs to grow your baby and sustain a healthy pregnancy. While feeling and honoring hunger cues are a normal part of a good relationship with food, hunger during pregnancy can sometimes seem scary or even confusing. Pregnancy hunger can sometimes feel chaotic and out-of-control. But it doesn’t have to be this way. The truth is that your body is fully capable of doing what it needs to do to keep you and your baby healthy, and most of all, your body can be trusted. This is where intuitive eating can be helpful, as a way to support you through seasons where your body might feel a bit foreign to you. No matter what changes your body is going through, you can learn how to dial in to exactly what your body needs and feel confident to give your body just that. Before we talk about how intuitive eating can help you navigate pregnancy hunger, let’s step back first. Why can hunger feel so much more intense and frequent during pregnancy, and is this normal? For starters, you are completely normal, mama! Your body is undergoing so many changes in a short period of time to grow your sweet baby, and it is working HARD. Our bodies are so smart. They are constantly taking information from inside and out and recalibrating based on the different changes we are going through. For example, think about how our bodies want to be at a certain temperature (generally, 98.6 degrees). When you are sick and have a fever, your body responds accordingly to try to bring your temperature back down. You might get the chills or sweat as your body tries to recalibrate. Similarly if your temperature were to drop below what is normal - your body would work hard to try to get your temperature back up. Similar mechanisms happen in our body when it comes to nutrition and food. Our body knows what it needs to function at its best. 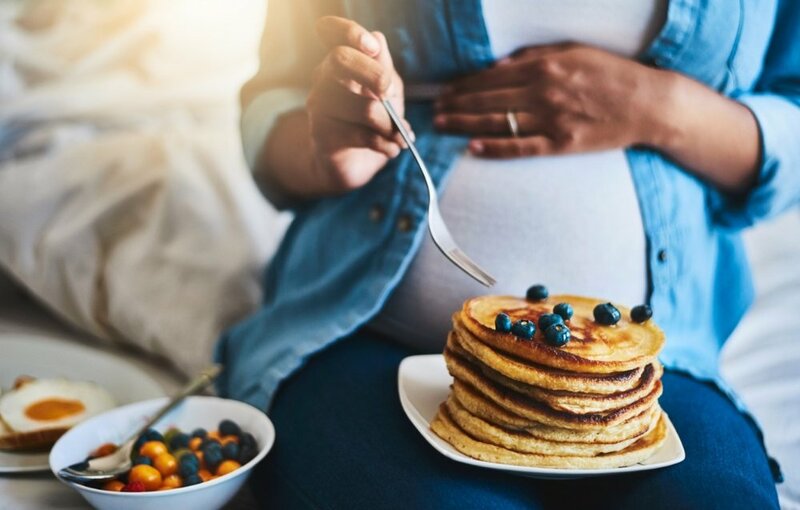 During pregnancy, changes that are happening in your body as your baby grows will require additional nutrients and calories to support these changes. Your body will respond appropriately by prompting increased hunger cues when you need more nutrition to support these changes. What are the changes happening in your body during pregnancy that would require extra calories? Phew! I’m tired just thinking about how hard your body is working to grow your precious baby. Because your body needs MORE nutrition and calories to support these changes, it is very common to have periods of time in pregnancy where your stomach might feel like a bottomless pit. Even if this hunger seems more intense than anything you’ve ever experienced before, it is not something to fear. It’s simply your body’s way of telling you it needs more energy to do the jobs involved with growing a baby. Hunger is not something to control; nor does feeling hungry signal that you are out of control. It is a simple and basic bodily mechanism for keeping you alive and helping you get your body what it needs to survive. You might want to restrict your eating if food feels chaotic or your unsure how to respond to what your body is telling you. But restrained eating during pregnancy can be especially dangerous and create adverse outcomes for you and your baby. If you feel out-of-control with pregnancy hunger, this is where intuitive eating can be helpful. You might feel like because you are pregnant that this is somehow an exception to the rule, but guess what? You need to rely on your body even more during pregnancy to help you navigate what you need, because your body is responding accordingly to the baby growing inside you. So yeah - your doctor might say that you need to gain no more than X amount of pounds or your grandma might tell you to eat all the green vegetables you can get your hands on - but they are not living inside your pregnant body. YOU ARE. You are the only one who can be the expert of your body. In order to become the expert of your own body, you have to learn how to reconnect and rebuild trust with your body. You need to learn what hunger feels like, what fullness feel likes, what tastes good to you and what foods you would rather not eat. This might change during pregnancy because your body is changing to accommodate your growing baby. The more you rekindle a trusting relationship with your body, the more you can easily respond to it as things change. Following the intuitive eating principles will ultimately help you become the best expert of your body, which can build your confidence in how you care for yourself and respond to pregnancy hunger. These principles are also key to helping you create a peaceful relationship with food and your body, during and after pregnancy, so you can confidently care for your physical and mental health for years to come. Being an intuitive eater helps you explore your body and the cues that it is giving you from a place of curiosity rather than judgement. When you can practice this mindset shift, you are free to give your body the food that it needs with unconditional permission to nourish your body appropriately. Pregnancy diets (or any other diet for that matter) are completely unethical, harmful and ineffective. It’s common to want to turn to a diet or outside set of rules when you feel like you can’t trust your own body. As you rebuild trust with your body through intuitive eating, you will build confidence in yourself as the expert of your own body. This means you can stop listening to the external guidelines for eating and throw all diets out the window - for good. The premise of intuitive eating is building trust with your body (see a theme here?). For some women, it takes time to learn how to listen to your body again and to trust it as the expert of what you need. When you take back ownership of your basic eating signals, you can truly make peace food over the course of your lifetime and become a healthier person overall. Hunger is not meant to be something to fear, resist or control. Hunger is our bodies way of communicating with us when there is something we need. Eating and enjoying food are basic needs that every human deserves. Every time we respond to what our bodies need and honor our hunger, we build trust with ourselves. Attunement to your body’s satiety cues is an equally important part of intuitive eating. Exploring what foods feel good in your body during pregnancy is needed to help you feel satisfied. Eating whatever you feel like without regard for your hunger and fullness cues is not part of eating intuitively. Allow yourself the space to rediscover what foods bring contentment and satisfaction in your body. Keep in mind that this might change throughout pregnancy - that is perfectly normal and okay! Ultimately, these tools will help you respond to your body and hunger/fullness cues from a place of trust and confidence, rather than a place of fear and uncertainty. This is important for overall health, no matter what stage of life you’re in. If you’re interested in learning more about each of the intuitive eating principles, please check out the intuitive eating workbook for practical exercises to help you develop a healthy relationship with food. There are many factors that can cause a disruption in normal hunger and fullness cues. For example, pregnant women who have had a history of an eating disorder or who chronically dieted in the past may have a harder time reading the cues their bodies are giving them during pregnancy. Chronic dieters lose touch with their internal regulators of appetite, hunger, and satiety. Pregnancy can be a time that brings many unresolved eating issues to the surface. It can be difficult to feel as though you can trust your body through pregnancy, especially if you have not had a healthy relationship with food before becoming pregnant. Feeling something as normal as hunger, fullness, or experiencing weight gain can be a chaotic experience for a woman with an unhealthy relationship with food or who is unable to fully trust herself or her body. If you have found yourself in this situation, please know that you are not alone. There is hope for you and your baby, and you can fully heal your relationship with food and your body. You don’t have to do this alone. Please consider working with a prenatal dietitian who specializes in eating disorders and intuitive eating to support your recovery and guide you through a healthy pregnancy. Throughout your pregnancy (and lifetime), remember that you can trust your body. You can build an alliance with your body rather than fear or resist the ways it it trying to keep you (and your baby), alive, nourished, and safe. If you’ve had a hard time responding to what your body needs, use pregnancy as a time of appreciation for what your body is capable of doing. Practice being kind toward your body by feeding it well and nurturing yourself, physically and mentally. You can trust the information your body is giving you to help guide your eating during your pregnancy and throughout your life! Connect with me to learn more about how a prenatal nutritionist can support you during pregnancy!